Her origin story is pure Cinderella, but here the heroine is waif, prince, and fairy godmother rolled into one. Her rags-to-riches ascent is well-told, but let’s revisit: Single mom – living on government assistance – rides train and conceives a fully formed idea for a children’s book. She spins her vision into words in a Scottish café – in longhand, no less – as the baby naps. Our mom receives a dozen rejections from publishers, until one publisher’s 8-year-old daughter, Alice, inhales the first chapter and begs to read the rest of Harry Potter and the Sorcerer’s Stone. And a kid-lit tour de force – J.K. Rowling – was born. You know what happened next: more books, gazillions of dollars (richer than the Queen), movies, more books, and a screenplay (Fantastic Beasts and Where to Find Them). Blessed with an apparently bottomless imagination, Rowling then turned her focus to the magical world of theme parks. Not since Disneyland opened back in 1955 had the theme park industry seen such buzz. As the behemoth of princesses and pirates, Disney was raring to enter the wizarding business, but backed off when Rowling insisted on too much creative control. (She’s no dummy, our empire-builder.) Universal Studios Florida – wise to include Rowling in everything Her Brilliance required – won the rights to the wizard saga, secure in the knowledge that if they did their jobs right, droves of devoted Harry Potter fans would descend on the newly discovered motherland. In 2010, Universal opened the Wizarding World of Harry Potter’s Hogsmeade in the Islands of Adventure in Orlando for a cool $250 million. The Muggle world held its collective breath. Would the fan-base cheer? Or would they shake their heads in disappointment? The earliest guests tasted the Butterbeer, rode the centerpiece experience, and chose a wand in Ollivander’s wand shop. Quickly, the news spread: Universal and Rowling had nailed it. Four successful years later, Universal spent $400 million more and unveiled Diagon Alley in Universal Studios Florida right next to the Islands of Adventure. That’s when the twins and I agreed it was time! Here’s the scoop: Universal’s Islands of Adventure is home to Suess Landing, the Lost Continent, Jurassic Park, Marvel Super Hero Island, Skull Island – and The Wizarding World (Hogsmeade). The second park, Universal Studios Florida, is the site of Production Central (Despicable Me, Shrek and the like), New York, San Francisco, Hollywood, World Expo, Woody Woodpecker’s KidZone – and The Wizarding World (Diagon Alley). In my world, theme parks have always been about the rides and shows. I never buy food and rarely buy souvenirs in a park. That said, The Wizarding World is heavy on immersive experience. Families revel in the detailed atmosphere layered into every nook and cranny in the taverns, shops, rides, and attractions. So, if you totally avoid eating wizard-food or tasting Butterbeer, you’re missing a big part of Harry’s world. If you’re on a budget, however, choosing one item and forgoing the rest will work just fine. In the back of the Islands of Adventure, you’ll pass into Hogsmeade through an Old World-like arch, and find yourself amid shops seemingly from centuries ago. You’ll cross cobblestoned streets and see snow on the steep A-line roofs topped with crooked, fairytale-style chimneys. Hogsmeade is home to Honeydukes – a candy shop from the books brimming with Exploding Bon Bons, Fizzing Whizzbees, and beautifully packaged Chocolate Frogs (a 4-pack with four wizard cards is $50). The Three Broomsticks, a rustic tavern with wizard atmosphere galore, serves traditional British fare in nice-sized portions. The menu includes Cornish pasties ($10), fish n’ chips ($14) and a smoked turkey leg ($15). Picky Muggles will find chicken fingers ($7) and mac n’ cheese ($7). The Hog’s Head Pub is toward the rear of the tavern serving beer and Butterbeer for $7 a pint. Butterbeer – frozen, hot, or regular – is sold throughout both parks. You’ll likely find a shorter line inside the pub rather than buying this fun, non-alcoholic drink at an outdoor stand. Connoisseurs rave about the frozen Butterbeer, even with the accompanying brain freeze. The Owl Post lets guests send letters marked with an actual Hogsmeade stamp. Ollivander’s is next door to the Post and features the “wand chooses the wizard” show that plucks one child from the small audience to experience an exciting wizard-moment. (Warning: It’s only exciting if the parent plans to buy the wand after the child is chosen). If your child would love to be picked and wasn’t, plan to attend another round, happening regularly throughout the day. Ollivander’s sells both regular ($44) and interactive wands ($50 and up) that let users cast about two dozen spells throughout both parks (map provided). Best ride: Hogsmeade is home to three rides, but by far, the most cutting edge experience to enter our universe is Harry Potter and the Forbidden Journey, which takes off from within the iconic Hogwarts Castle. We joined the Forbidden Journey queue, and toured rooms and scenes from the Potter stories that included those amazing talking paintings, Dumbledore’s office, and the Defense Against the Dark Arts classroom, to name just a few. Hogsmeade is also home to two outdoor roller coasters. The gentle Flight of the Hippogriff is for little guys, and the Dragon Challenge is a traditional white-knuckle scream machine. True fans will want to experience both rides. While waiting in line, catch sight of the flying car Ron and Harry crashed into the Whomping Willow. Fun and free: One of this mom’s favorite attractions in any theme park? Hands-down, the restroom! But the Hogsmeade powder rooms are even more special than your average, thanks to the devoted haunting by one Moaning Myrtle. Live shows: Inspired by scenes in the books and movies, live shows entertain guests throughout both parks. The stages are casual and don’t have seating. The shows range from okay to quite good, and offer ample photo ops. Hogsmeade hosts both the Frog Choir and the Triwizard Spirit Rally on a stage that sits between the Flight of the Hippogriff and the Dragon’s Challenge. The Frog Choir is comprised of four singers, two of whom hold frog puppets on pillows. It’s a cute, 10-minute act that’s fine if you happen to be walking by. The Triwizard Spirit Rally features cool martial arts moves and dancing. Over in six minutes, fans will be happy they caught the Triwizards’ show. 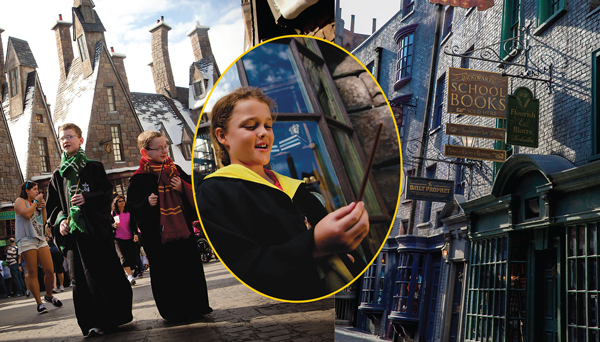 For the full wizarding experience, ride the Hogwarts Express from Hogsmeade and disembark in Diagon Alley. A second choice is to enter Diagon Alley from inside Universal Studios Florida. In the books, Diagon Alley is hidden from Muggles. Staying true to the book, Diagon Alley is hidden behind a giant brick wall in its London section of the park. Look for an unmarked wall to the right of the blue Leicester Station sign. You’ve now entered an immersive world packed with a second – and larger – Ollivander’s wand shop, Weasleys’ Wizard Wheezes (three colorful floors of novelty joke items), and Florean Fortescue’s Ice-Cream Parlor (the ice cream version of Butterbeer has received lackluster reviews). You might want to grab a photo of everyone in your family on broomsticks at Shutterbutton’s Photography Studio. And, should you need a Death Eater mask, you’ll find Knockturn Alley just off the main corridor where you can stock up on Dark Arts items. Spooky and worth it to see, but ask because it’s also hidden. Dine at the Leaky Cauldron – dripping in cool wizard architecture – that serves traditional English plates, including cottage pie ($12.50), Guinness stew ($13.50), and fish ‘n chips ($14). The dessert menu has sticky toffee pudding ($7), chocolate potted cream ($4.50), and more. Diagon Alley is home to many more shops like Madam Malkin’s that sells Hermione’s Yule ball gown and more cool costumes from the movies. You’ll also find more spots to wet your whistle such as The Hopping Pot, The Fountain of Fair Fortune (Butterbeer and more Harry drinks), and Eternelle’s Elixir of Refreshments where you can mix your own elixir to drink. Best ride: We queued up for the Harry Potter and the Escape from Gringotts ride and noted that, yet again, Universal has set a new bar for being entertained while waiting in line. In the Gringotts’ queue, guests are treated to exact replicas of the goblin bank tellers from the movies that are so realistic they seemed to be staring right at us. Good creepy fun. On the ride, you see Griphook and Bill Weasley come upon Harry, Ron, and Hermione, who are fleeing Voldemort and Bellatrix Lestrange. From there, it’s 3D excitement with sharp turns, sudden drops and fast scenes. Potter fans will debate which is better: Forbidden Journey (in Hogsmeade) or Gringotts? I’m Team Gringotts. My boys are all about Forbidden Journey. Looking for the Knight Bus? This triple-decker vehicle from the third book/movie sits in front of the entrance to Diagon Alley. Peek through the windows to see the magical interior. Talk with the Knight Bus conductor, and don’t be surprised when the shrunken head joins in the conversation. Live shows: Diagon Alley seems to have cornered the market on fantastic live shows. Both shows are on stage in Diagon Alley’s Carkitt Market (walk toward Gringotts Bank, turn to the right, and you will enter Carkitt Market.) The first show features Celestina Warbeck and the Banshees. Celestina’s singing style seems to pair Motown and the Big Band era. Rowling wrote the songs’ titles: “You Stole My Cauldron but You Can’t Have My Heart,” and “You Charmed the Heart Right Out of Me.” The 13-minute show includes audience participation. Even those who haven’t read the books or seen the movies will love this lively show. Worth your time! 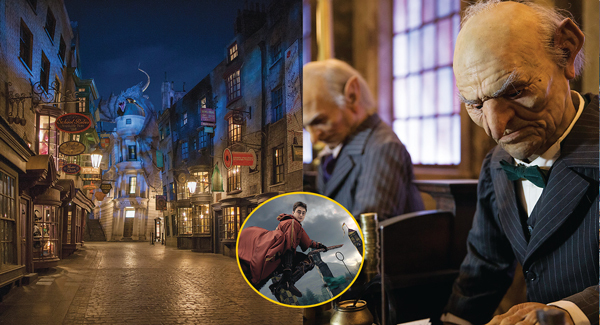 You can purchase a single-park ticket (about $110) to the Islands of Adventure and tour Hogsmeade one day and purchase another single-park ticket to Universal Studios Florida to explore Diagon Alley the next. But to experience all of the Wizarding World – including riding the Hogwarts Express – you’ll need park-to-park passes. What you’ll pay: Prices vary based on the season, but a park-to-park ticket for one person on a busy day is $179 ($5 less for kids ages 3 to 9) – bringing the total for a family of four with youngsters to $751.90. In September, the price drops to $165/adult and $160/child, which doesn’t seem significant until you remember that the crowd drops, too. January may be even cheaper, but the website hadn’t released 2018 prices at press time. Do they have passes? Similar to Disney’s FastPass, the Universal Express Unlimited pass lets you skip the line on rides over and over again (no limit). The latest and greatest news: The Express Unlimited passes began applying to every Wizarding World ride last month. Prices for these passes start at $50 and skyrocket from there. Sure, they’re not cheap, but if you visit during a high-crowd month, the passes may save your trip. Be shrewd. Once you purchase tickets online, you’ll receive several up-selling suggestions including character breakfasts and dining packages. My point: Enter Universal’s parks armed with the same consumer savvy you used when purchasing your home. Your smart thinking may just save you a mortgage payment or two. Best times to visit? Avoid crowds by visiting when school is in session. Most of fall and late January are good for low(er) crowds, but it’s important to know, crowds are always going to be insane. End of story. Orlandoinformer.com has a nice crowd calendar, bless their hearts. Live performances? Be on the lookout for schedules and ask staff when you arrive. It’s too easy to miss performances. Bottom line on family travel? Obsessed fans – and I mean that in the nicest way – will embrace The Wizarding World, and visit multiple times no matter the costs or crowds. For my family? Exploring all of both parks one time was wonderful and sufficient (yes, even though I missed a lot of shows). So let’s all wish a happy anniversary to J.K. Rowling and Harry Potter and the Sorcerer’s Stone. Can you believe the book turned twenty this summer? And if you’re among the millions of families who fell in love with reading because of these characters and the world they inhabit, you can thank a little girl named Alice who talked her publisher father into letting her read one more chapter! 1. Few families can afford to vacation without doing their homework, or crunching the numbers. You can save by visiting during off-seasons and mid-week. The only down side? Some rides receive maintenance work during the off-season and may be closed, so ask if there’s a ride-closure schedule before buying tickets. 2. Before you go, set a budget with your family and discuss how you’ll eat in the parks. Coolers are a don’t at Universal, but you can bring in soft insulated bags, bottled water, small meals, and snacks. 3. Purchase admission tickets at Universal’s website versus at the gate. Never buy at the gate – like, not ever! 4. 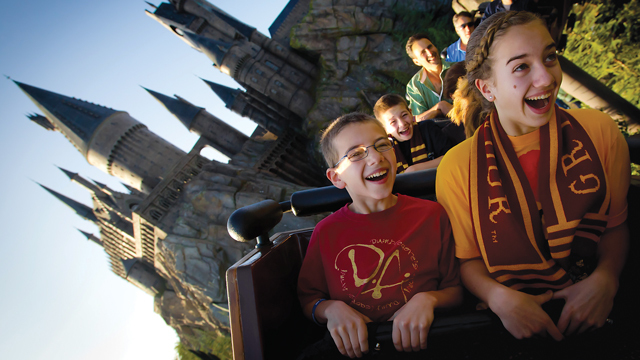 Favorite savings hack at every park: Buy Harry Potter shirts and robes ahead of time – not in the park. Open your suitcase and surprise your kids with the loot. There’s one exception: Interactive wands are actually cheaper in the parks than on Amazon. 5. Create your secret plan for trekking through the parks (orlandoinformer.com has free ones). Calculate the cost of one hour in the park, factoring in food, souvenirs, and add-on activities. That friendly answer will rule your day. 7. Spending a full day in Wizarding World? Consider sleeping in a budget hotel. We stay in theme park hotels only when there’s time for the amenities (or it makes financial sense). Comfort Inn and Suites Convention Center and Country Inn & Suites by Carlson, both in Orlando, deliver free parking, a shuttle to Wizarding World (zero parking fees), and a free hot breakfast. 8. Interested in more luxurious digs? Universal has five hotels ranging from glorious – Lowe’s Portofino – to budget-cool – Cabana Bay Beach Resort – and in between – the brand new Sapphire Falls. Biggest benefit of staying in Universal hotels? All of these hotels give you early-park entrance. The higher-end hotels deliver a water-taxi ride to and from the parks, and free Universal Express Unlimited passes. Note: Express passes are not included with your stay at Cabana Bay or Sapphire Falls. 9. Research these sites for more great tips and savings at Universal: mousesavers.com (not limited to Disney); orlandoinformer.com; undercovertourist.com; themeparkinsider.com; costco.com (deals for members). 10. Roundtrip airfare from RVA to the Orlando International Airport for a family of four runs about a thousand bucks. A 12-hour car ride to Orlando is your cheapest ride – especially if you use gasbuddy.com for rockin’ gas prices. But the most wondrous travel experience? Rocket to Orlando in Amtrak’s sleeper roomette (two roomettes sleep four and run $1300 to $1800 roundtrip). It’s super-fun – at least-once!